Browse: Home / 2018 / September / 22 / Recent Findings: Austrian Glacier Extent Over Most Of The Past 10,000 Years Less Than Today! In 1998 there were 925 glaciers and large ice masses in Austria with an area of 1 hectare or more, in total 453 square kilometers. Fifty percent of the Austrian glacier area are found in the Ötztal Alps and Venice Alps groups. All measured glaciers in Austria have significantly lost area and volume in the period since 1980. For example, in the southern Ötztal Alps, the largest contiguous glacier area in Austria, glacier area decreased from 144.2 km² in 1969 to 126.6 km² in 1997 and 116.1 km² in 2006 (APCC 2014). Previously, in the 1960s and 1970s, considerable glacial advances had occurred in Austria for a few years (Fig. 1). Over the long run, however, there has been a marked melting trend over the last century and a half. 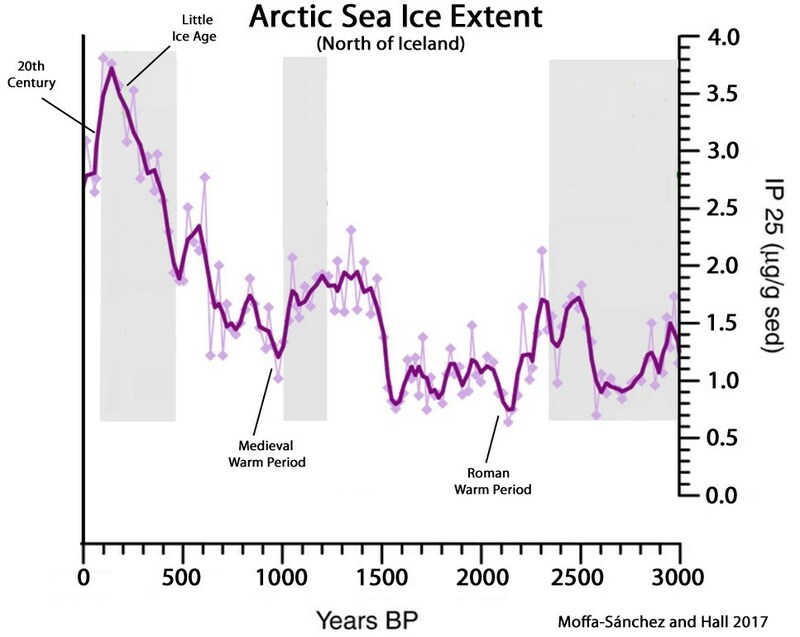 This loss of ice fits well with the rise in temperature during the rewarming since the end of the Little Ice Age. 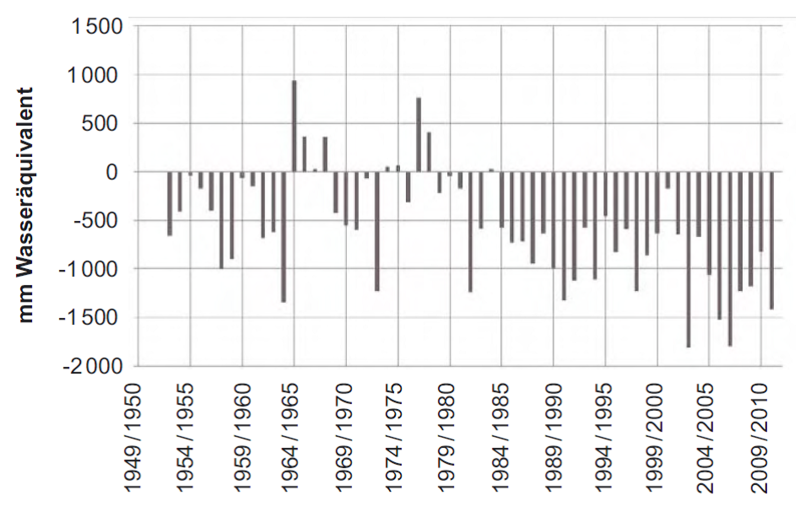 Figure 1: Annual ice mass balances 1952-2011. Negative values ​​mean ice melt, positive values ​​mark ice gains, 1952-2011. Source: APCC 2014 as to Fischer et al. (2012). However, the longer-term climate context is also important. 1000 years ago – at the time of the Medieval Warm Period – many Alpine glaciers were as small as they are today. In the transition over to the Little Ice Age, the glaciers in the Alps grew strongly, and reached their greatest extent for the past 10,000 years. At the end of the Little Ice Age, the glaciers started to melt again, and this continues today. In the Swiss glaciers this has led to the frequent finding of tree remnants from the time of 1000 years A.D., i.e. the Medieval Warm Period. Obviously parts of today’s glacial areas were forested during the times of strong glacier retreat. 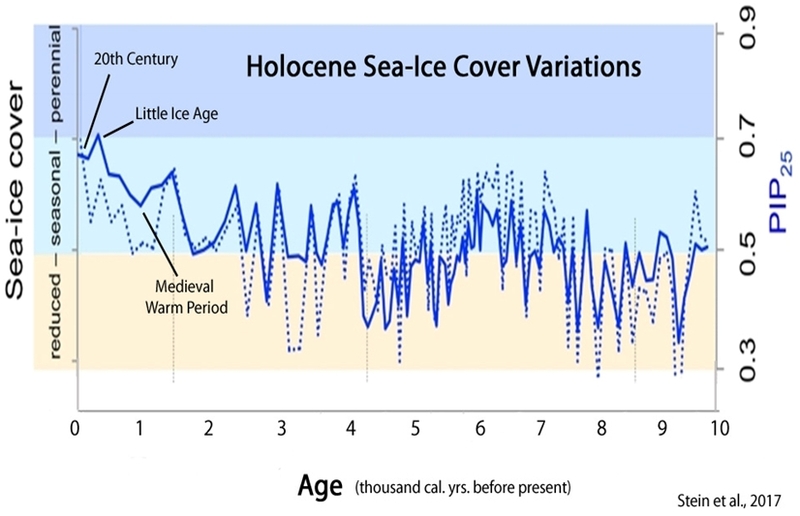 Another more intensive melting phase had already occurred 8000 to 4000 years ago during the so-called Holocene Warm Period when many glaciers were smaller than they are today (Fig. 2). Figure 2: Years before 2000 AD. The blue bars mark the times when many alpine glaciers were less than today. 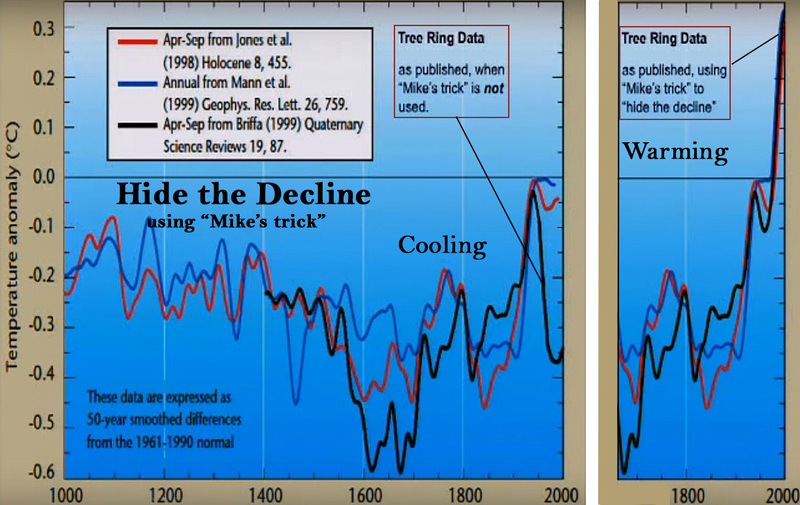 Shown are data based on tree rings and C14 dating. Chart changed as to APCC 2014. 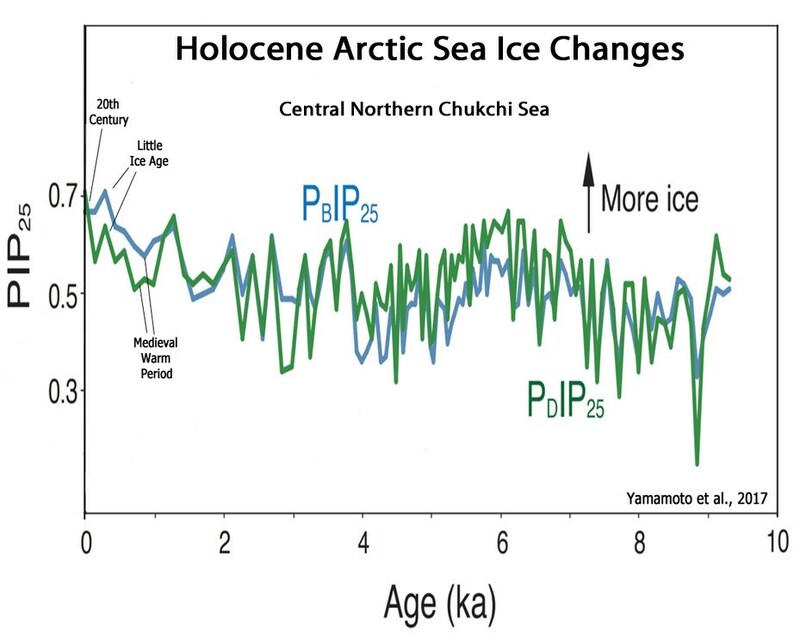 Several years ago I came across two or three articles describing how glacial melt today was exposing evidence past less coverage around 6,000 years ago during the Holocene Optimum. So I wrote a web page and have occasionally added to it. That period has gone a long way to not stressing over current melting. The current change is well within what we’ve seen in the past. You’re only believing fringe alarmist propaganda if you believe otherwise. The current change is well within what we’ve seen in the past. Even if that were the case, where is the logic in believing that the current change happens for the same reasons as in past instances when we observe something completely different? There is absolutely ZERO EVIDENCE that the current slight but highly beneficial warming out of the coldest period in 10,000 years is ANYTHING BUT NATURAL. We have NOT observed something completely different. You have ZERO-EVIDENCE of that fairy-tale. Your mindless ranting IS NOT PROOF of anything except your petulance and childish attention-seeking trolling. You truely don’t know what you are doing, spike55. Doesn’t there first need to be something unusual or remarkable about the “current change” for there to be a need to decide that something must be different about its cause? What’s unusual about today’s climate? Doesn’t there first need to be something unusual or remarkable about the “current change” for there to be a need to decide that something must be different about its cause? Not at all. Who told you that? Peter Taylor the “scientist”? Besides, the unusual thing about the current change is that it is caused by increased greenhouse gases in the atmosphere. I find that remarkable too, but obviously that a subjective classification. If you think the current change needs to be faster or of higher magnitude than anything that happened in the past to be “unusual or remarkable” that’s a different story. Say you’ve won the lottery and the price is your last monthly salary for 10 years. You decide to quit your current job and go on an extended holiday. Is the monthly amount that is transfered to your bank account “unusual or remarkable”? Certainly not! And yet the cause is completely different now and an observer can identify that cause with ease … same with climate science if you actually understood the mechanisms you are trying to argue against. Then why do scientists spend so much time trying to detect an “anthropogenic signal” that is distinct from natural variability? Why has there been such an effort to “hide the decline” and “get rid of the Medieval Warm Period” if there is no concern that modern climate changes (or glacier melt or sea level rise) fail to distinguish themselves from natural variability? Besides, the unusual thing about the current change is that it is caused by increased greenhouse gases in the atmosphere. If you think the current change needs to be faster or of higher magnitude than anything that happened in the past to be “unusual or remarkable” that’s a different story. That’s precisely the reason why Mann and colleagues made up a hockey stick graph. The modern era wasn’t unusual, with temperatures declining after the 1940s, so the data were changed using “Mike’s Nature trick” to make the recent temperatures look unusual. The fallacies are all on the alarmist side. So far none have come true. So far none have come true. Good one … has anything from the pseudoskeptic side ever become true or successfully opened a new chapter in climate science / physics? Or were all projections of future cooling wrong and nothing even remotely works like you guys imagine? Many of the skeptics are not even projecting cooling, rather modest, harmless (even beneficial) warming. In general skeptics simply do not believe any of the urgent claims of a climate spiraling out of control and all the ridiculous claims of every single weather event now being due to man-made CO2. If you haven’t seen that by now, then you’ve doing a really lousy job following this issue. Many of the skeptics are not even projecting cooling, rather modest, harmless (even beneficial) warming. Most of the climate scientists are also not projecting 60 m sea level rise or 10 degrees warming or an ice free Arctic in this decade. Yet you guys work yourself off on such predictions with very special input variables as if that is what is happening. Haven’t you predicted yourself that the temperature anomaly will be -2.x °C by 2020? In general skeptics simply do not believe any of the urgent claims of a climate spiraling out of control and all the ridiculous claims of every single weather event now being due to man-made CO2. The urgency comes from the need to change how we power our societies now. Nobody is claiming anything is spiraling out of control. The attribution thing is something that pseudoskeptics also not get. Attributing one event to anything is difficult, that doesn’t mean man made warming didn’t contribute to the severity of an event. Unfortunately we have no Earth2 to conduct these kind of experiments. If you haven’t seen that by now, then you’ve doing a really lousy job following this issue. I’ve seen pseudoskeptics making up all kind of excuses why they don’t want to learn how the mechanisms they argue against work. That’s all. Complete and utter anti-science BS. Stop making such IDIOTIC garbage statements. There is absolutely ZERO need to change the way our societies get their electricity. There is NO SCIENTIFIC EVIDENCE that points to this need. And there’s that mythical “mechanism” that you are totally unable explain in rational scientific terms or to produce one tiny piece of evidence to support its existence. The seb FANTASY la-la-land where science need never be seen or heard from. I hope this is not another attempt at “it was warm before”. Is it? Yes, we know you don’t like it when science finds there is nothing unusual, unprecedented, or even remarkable about the current climate conditions, or that modern temperatures are only slightly warmer than the coldest centuries of the last 10,000 years. 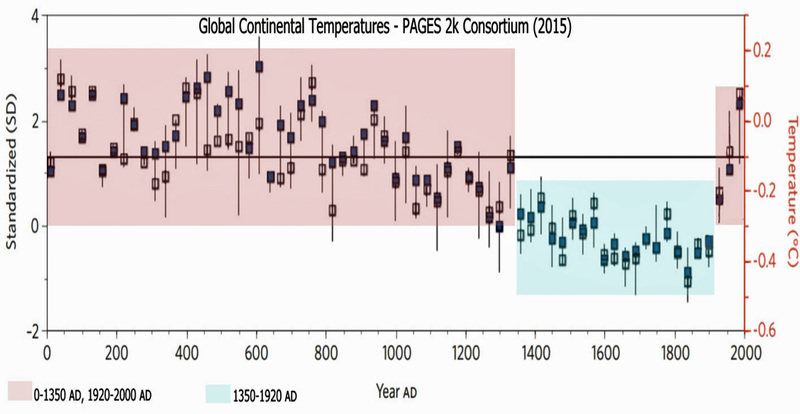 or that modern temperatures are only slightly warmer than the coldest centuries of the last 10,000 years. SEB, in DENIAL of the FACTS, yet again. Science DOES find that there is NOTHING unusual happening with the climate. You have NO SCIENCE that says otherwise. STOP running and hiding behind your mindless bluster. First one doesn’t need support. You have never presented any evidence of anything unusual happening with climate. It must be very sad for you, seb, having to be a Climate Change DENIER to push your anti-science AGW beliefs. Do you think there is no global warming (“global warming disputed” / “non-warming graphs”)? So you choose to completely ignore that the global heat content increases at a rate that matches the imbalance created by the enhanced GHE? Even if that were true for climate science as a whole, why do you think that excludes that humans are causing the current warming? Oceans warming by 0.08C in 60 years, with a Grand Solar Maximum during that time. Only warming in 40 years has come from El Nino ocean releases. Less than 1C warming out of the coldest period in 10,000 years. And yes we know that the GISS data “adjustments” just happen to match CO2, increase.. that’s the only “man-made” warming, but its a fabrication, part of the AGW fantasy. You BELIEVE is things that have absolutely ZERO scientific evidence to support them, and DENY the facts about the real cause of atmospheric temperature. Not one skerrick of evidential science. You can’t even answer basic questions, that’s how pathetic your fallacy is. Totally ILLOGICAL. Dear master troll, please provide evidence for anything you’ve claimed over the past year … and don’t project your own shortcoming onto others. Thank you. I wonder if he knows how pathetic he is. You have shown a complete inability to counter that FACT. I have been reading Kyle Harper’s, ‘The Fate of Rome: climate, disease, and the end of an empire’ which has a considerable bit about what he calls the Roman Climatic Optimum, dating it between 200BC and 150AD (although other historians seem to favour it lasting until 200AD or a bit longer). He says the optimum was a completely different climate to today with the Mediterranean basin basically humid. Ptolemy the scientist is on record as saying that it rained in Alexandria every month of the year apart from August – which is quite different from today’s climate. Mediterranean climate after the end of the optimum (during the 4th and 5th century AD) was much more like today’s climate where Azores Highs cause dry weather in summer and the rain to fall mainly in the winters. NW Europe on the other hand (in the 4th and 5th centuries AD) was dominated by Icelandic Lows = lots of rain (and cool weather in comparison to what it had been in the Optimum). Harper makes the point that when Hannibal led his armies across the Alps what are today glaciers did not exist. Pliny the Elder also had something to say about the weather if I remember rightly. He also says that elephants lived wild in the Atlas mountains, a relic of the early to mid Holocene when the Sahara was green. This was the source of Hannibal’s elephants. There is a very good reason that the 200 or so years leading up to the Little Ice Age was called the NEOGLACIATION. That is the period when most of the current non-polar glaciers were formed, as the Earth COOLED to the coldest period outside of a major ice age. We are VERY FORTUNATE to have had even a small amount of natural warming since that coldest of periods. There is a very good reason that the 2000 or so years leading up to the Little Ice Age was called the NEOGLACIATION. John say, thank you John. Here nice Video for Sahara. Very good explanations.